David Round’s stainless steel wire rope hoists come in a variety of electric and air powered styles. In addition to standard designs, we supply many special and custom units made of corrosion resistant stainless steel. We can engineer a low-headroom version when the application requires. There are explosion proof and weather resistant options available. Built almost entirely out of stainless steel, these wire rope hoists are ideal for sanitary processing environments. 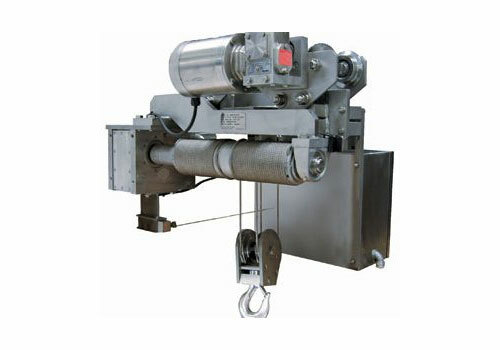 We can custom engineer a stainless steel wire rope hoist to fit your needs. Need low headroom designs? No problem! Submit your request now!